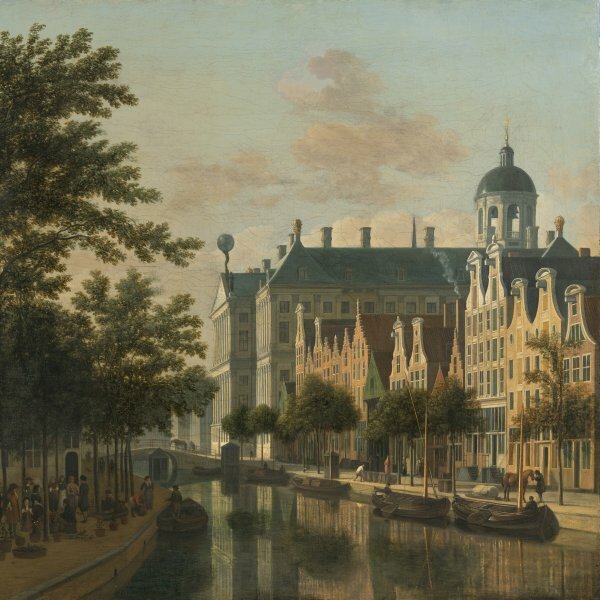 Berckheyde painted numerous views of the city of Amsterdam as well as the streets and building of The Hague, as in the present case. 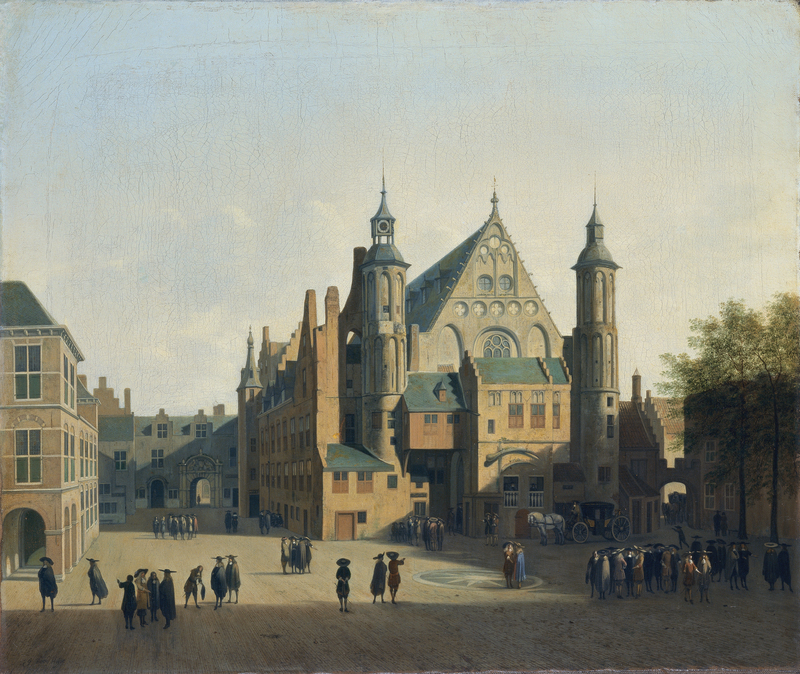 Using a high viewpoint, the artist locates us within one of the city’s most famous open spaces, the Binnenhof (interior courtyard) of the residence of the Counts of Holland, with the west façade of the Ridderzaal (Knights’ Hall) in the background. On the left is the Governor’s palace of 1639–40, built for Prince Frederick Henry, and the Binnenhof Gateway of 1634, rebuilt in 1685. The Ridderzaal was the meeting place of the Knights of the Order of the Golden Fleece, the home of the States General and the reception hall for ambassadors and other leading dignitaries during the 17th century. This fine building, an example of Gothic secular architecture, was built around 1275 by Count Floris V in order to expand the palace complex. The Ridderzaal is depicted here with a façade framed on either side by two delicate circular towers. At the period when Berckheyde painted this work the towers were surrounded by various additional structures that concealed part of the original building. With its steeply sloping roof to protect it from the weather, the Ridderzaal’s façade has a fine rose window with tracery, large blind arches and circular windows decorated with Gothic motifs. The interior courtyard in front of it is enlivened with a carriage located directly in front of the building and with numerous figures standing in circles, groups or alone, all conjuring up the bustle and activity of this location. The canvas is signed but not dated. It has been dated to around 1690 from the style of clothes worn by the figures and on the basis of a comparison with two other views of The Hague by Berckheyde (both in private collections) which are dated 1694 and 1695. Berckheyde constructed his view using precise draughtsmanship to define not just the principal forms of the façades but also the numerous architectural details such as the courtyard’s paving, the bricks of the buildings, the stone walls of the Ridderzaal and the exterior woodwork. In a manner typical of this artist’s style, the buildings are strongly outlined against a clear, pale sky that serves to emphasise the volumes of the architecture. Also typical of Berckheyde are the soft, transparent coloured shadows that do not distort the composition with abrupt contrasts. This is evident in the dark foreground in which the shadows alternate with brightly lit areas on the façades and on the ground. 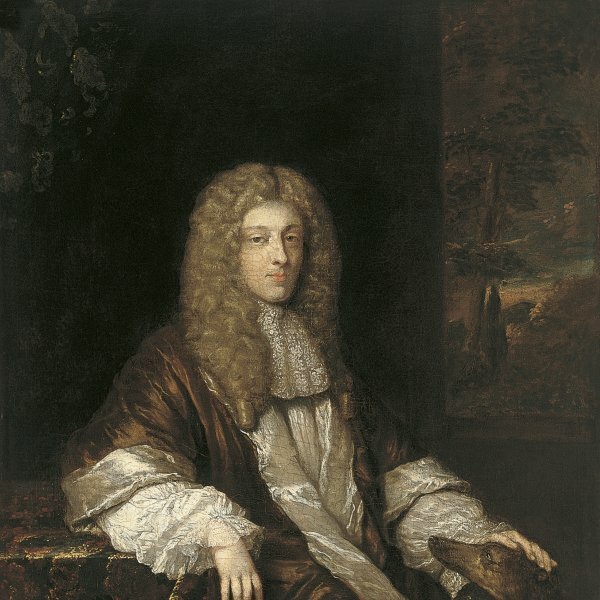 The painting also reveals another typical feature of Berckheyde’s late work, namely the use of a lighter chromatic range that looks forward to 18th-century painting. Five versions of this composition are known, in which Berckheyde experimented with effects of light and shadow. The closest to the present canvas is the one sold at Christie’s in London in 1986.